Interested in the "Learning from Women Over 85" workshop presented by author Amy Gorman? This workshop is beneficial for groups of all kinds; the workshop focuses on creativity and purpose as we age. Learn more about aging gracefully. Contact Amy for more information, call 510-527-4973, or visit www.agingartfully.com. Santa Fe Film Festival, Santa Fe, NM. Oakland International Film Festival, Oakland, CA. Mendocino Film Festival, Mendocino, CA. Santa Barbara International Film Festival, Santa Barbara, CA. Show-Me Missouri International Film Festival, Springfield, MO. American Society on Aging Media Festival, Chicago, Ill.
Berkeley Film & Video Festival, Berkeley, CA. Port Townsend Film Festival, Port Townsend, WA. 2006 Independents' Film Festival (IFF), The Education Channel, Tampa, FL. Real to Reel Film Festival, Kings Mountain, NC. Call (510) 527-4977 for upcoming screenings and events information. All events are free unless noted. Visit latest news for more information and photos here. The inspiring stories of these women are now available in print and on DVD. With the release of Amy Gorman's book, Aging Artfully, we are encouraged to make the DVD Still Kicking and the book available online for purchase. 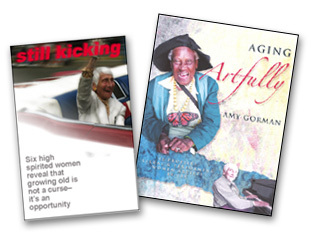 Visit the Aging Artfully web site to read more about Gorman's book here. To purchase DVD and/or book, use the purchase button. The film Still kicking honors the gift of age, and poignantly illustrates that growing old can be a time of creative expression and satisfaction. Challenging the perceptions and attitudes towards being old, still kicking is certain to trigger dialogue and ignite the imagination of us all. "In a world where we too frequently encounter negative images of aging, come book and film abundant with elders who, through love of and work with their particular craft, embody Browning's oft-quoted grow old with me the best is yet to be. In film, photography and oral history, Amy Gorman and Greg Young have captured the creative spirit of these remarkable Bay Area women." We would enjoy sending you progress of the film and book, upcoming screenings, and updates on the women. If you would like this information, click here.